Cotton is a 1 year old, 60-pound Labrador Retriever and American bulldog blend boy. This young boy is as sweet as can be! Cotton has never met a stranger – he is super friendly and greets everyone he meets like a long lost friend. You won’t want to miss out on one of Cotton’s famous doggie kisses – this gentleman just has so much love to give! Cotton enjoys spending time outdoors: going for a walk, playing in the backyard, or simply laying on the porch and soaking up the sun. Cotton is still a young boy so loves playtime and has plenty of energy for long walks. After a good play session, Cotton turns into quite the snuggle bug – he loves to cuddle up beside you on the couch, or bury himself in a cozy blanket on a comfy dog bed. Cotton gets along well with other dogs, big or small. He is a playful, young guy who isn't always quite aware of his size, so he would do best with another doggie mate that does not mind his playful nature. Cotton would also be very content as your one and only pet. 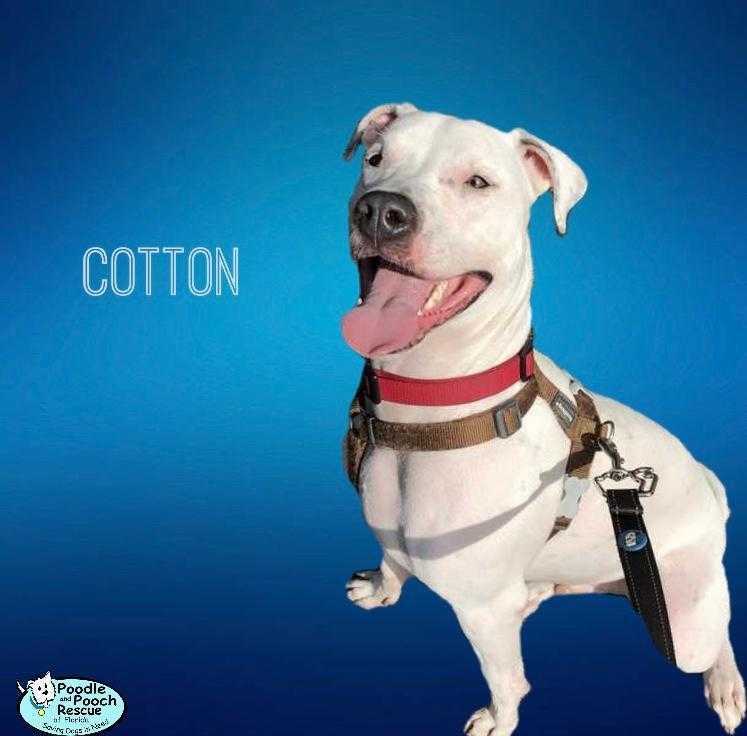 Cotton is deaf, but he is very attentive to his people and is learning to respond to hand signals, so his hearing deficit does not slow him down one bit. Being the young guy that he is, Cotton is still polishing some of his manners. He is also still learning to stay home along for extended periods of time, so someone who can be home more often would be a plus for Cotton. Fun-loving Cotton would make a wonderful addition to any family! Cotton is housetrained, heartworm negative, neutered, vaccinated, microchipped, and ready for his forever home. His adoption donation is $225 and will include three training sessions with a qualified force-free trainer.